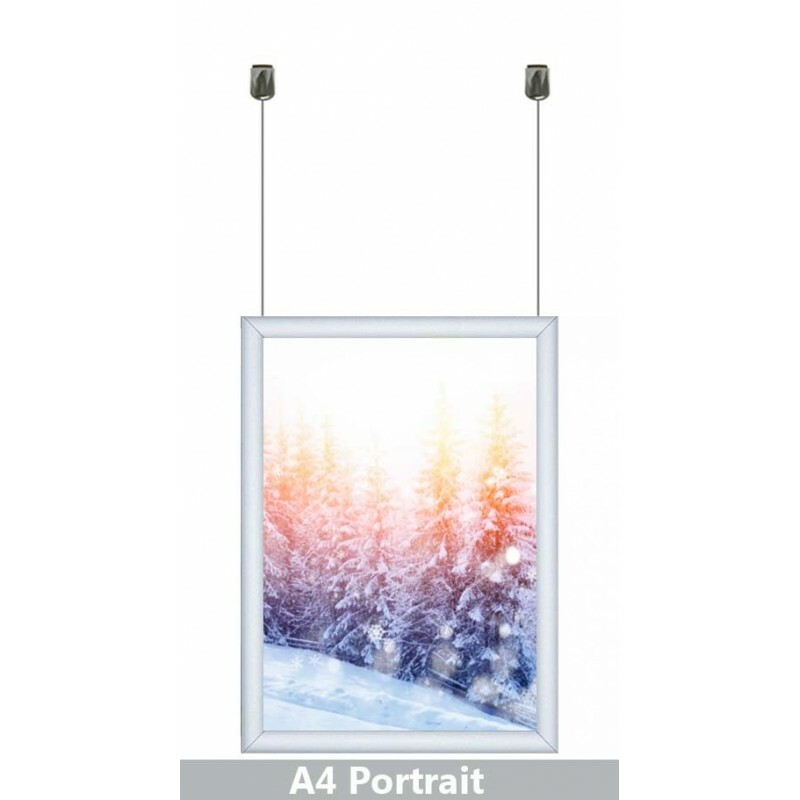 A0 Portrait & Landscape Aluminium Hanging Frames Silver. For double sided or custom colour frames such as RED Silver Black Blue White Gold or for any other colour please call. A0 Portrait. (W)87x(H)121cm Visual Area:(W)82x(H)117cm . This listing is for portrait frames if you need landscape format please contact us price is the same for portrait & landscape frames. 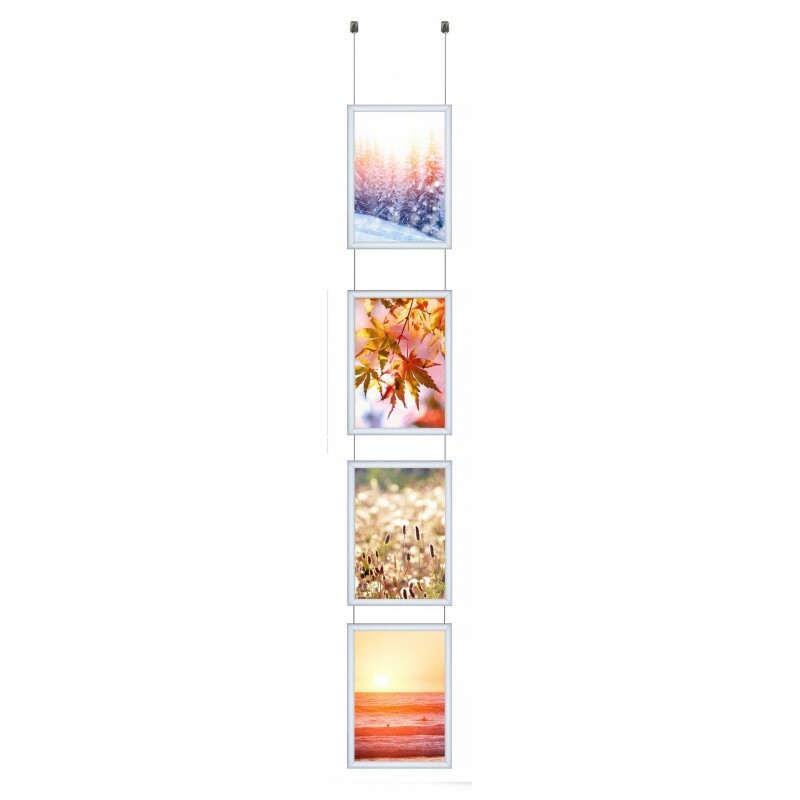 Ceiling hanging Snap frame kit means you don't need to screw anything on floor & cable will finish behind last hanging frame. 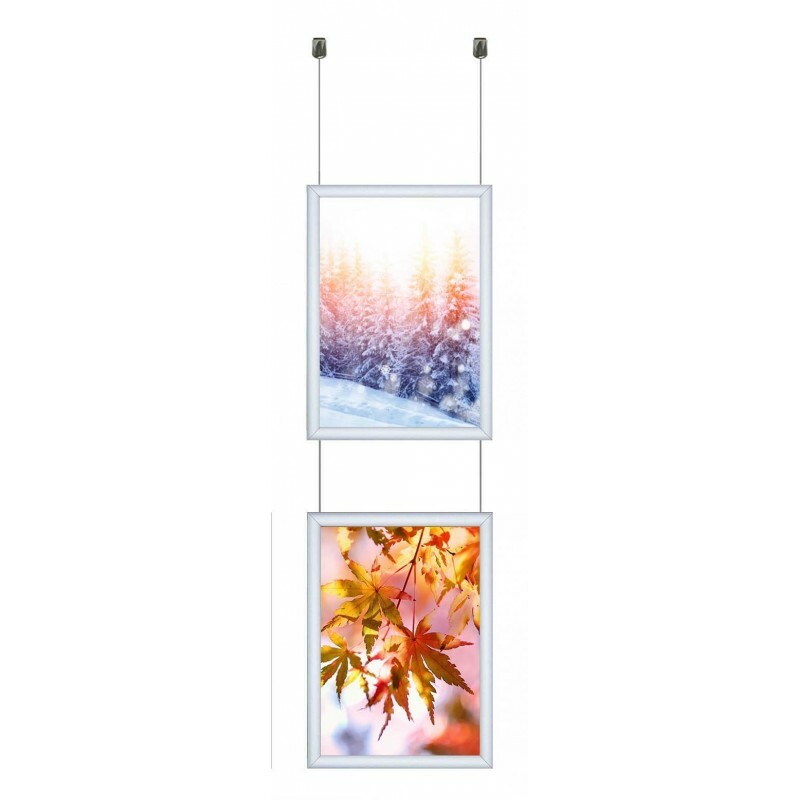 You can adjust frame height by sliding hooks up or down along the steel cable by hand. Easy To install 1) Untighten the ceiling cable split into 2 pieces. Screw brass part into the ceiling with a screw. Tight chrome part on brass part & suspend cable. You can cut the cable to size. 2) Slide in frame hanging hooks into the cable. You can slide these hooks up or down to adjust frame height without screwing or unscrewing.3) Lastly, you hang your frame on these hooks. You can hang as many as you like frames one above other by sliding extra hooks on same cables. We can also supply this with clear transparent. Snap Frames are made of Aluminium. Anti-glare PVC cover makes the frame suitable for indoor & outdoor use. Front opening click frame, The frames clips open with hand on all four sides allow you to remove current poster & put new. Lastly put the clear protective cover back in place and shut the all 4 sides to hold everything in place. The frame 25mm thick in total & 20mm overlap to cover the poster and has a strong grip on the poster. 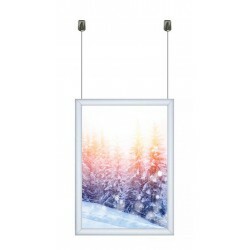 Each frame has a high-quality styrene back panel with a PVC clear Poster Cover which protects the poster or leaflets from water & dust. Ceiling or wall Hanging Mitred Snap Frames made of aluminium cab be used as Wall Poster Holder, Click Frame, Picture Clip Display, Retail Wall Notice Board etc.